It's Been A Long, Strange Road. Today is my last day at Duke Lemur Center. It's been a long, strange road. I had initially thought this would be a 2 month project but ended up taking 5 months (and more). Although I am leaving , this project is still ongoing. My research assistant Isabel Avery, along with Meg Dye (DLC lemur trainer) will be training my lemurs until they are ready to do the color vision tests. Out of 9 individuals that I am working with, only 2 are ready and is currently participating in the tests. The other 7 individuals are still being trained to do these tests. 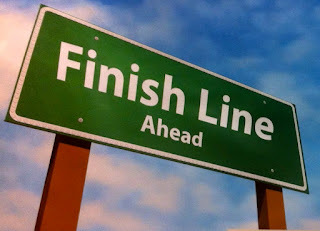 When the other 7 individuals are ready to start their tests, I will fly back to North Carolina to conduct these tests. This has been a long journey. I remember hating the fact that I have to be in North Carolina for two months but this place grew on me and even though I have been here for five months, I am enjoying every day of it ... except the fact that I miss my husband and my cats. My first few weeks in North Carolina was hard as I had to adjust to living in my hotel room and not spending time with my husband and cats. I wasn't use to being by myself. But I had fun. I did a lot in the area. I went to the flea markets, the farmers' markets, museums, antique stores, cafes, restaurant, shopping, and oh yes, SHOPPING. I thought being in Durham would be boring but it turns out that it wasn't that bad. 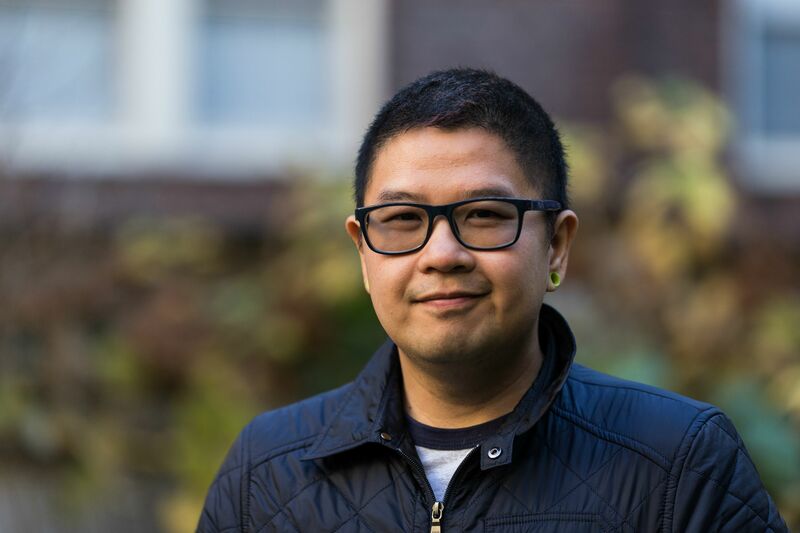 I kept getting asked by Uber drivers whether Durham was a big change for me. It wasn't. Actually, I really like Durham. And then I adopted my dog, Luna. She had been my companion and pretty much became my unofficial emotional support dog. Adjusting to being a dog parent is definitely challenging and comical at times. Dogs are much more demanding and needed much more work and attention compared to cats. I have raised both kitten and puppy now, and I must say ... cats definitely have evolved to be much more self sufficient than dogs. But Luna is a sweetheart. She's the impossible girl. Lemurpalooza is back again for yet another exciting palooza for Fall 2015. Hosted by Duke Lemur Center, Fall Lemurpalooza 2015 will have food trucks, live music, and lemurtastic activities for kids and kids at heart. You can also walk around and view the lemurs at your own pace (usually you'll need to be escorted by a tour guide) as well as being able to "adopt" the lemurs. 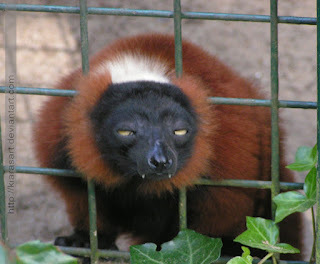 Money from these sponsorship goes to maintaining the lemurs at Duke Lemur Center as well as to fund conservation work. I will be at the Fall Lemurpalooza, so hope to see some of you there! You will be able to see all the ruffed lemurs that I mentioned in my blog posts during Fall Lemurpalooza, especially Halley & Kizzy. You will also be able to "adopt" some of them as well and I do encourage you to do so, not only for the animals but also for all the necessary conservation work in Madagascar. WHEN: 5 – 8 p.m., Saturday, September 26th, 2015. WHERE: Duke Lemur Center, 3705 Erwin Rd in Durham, NC. 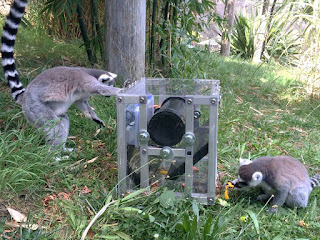 Ring-tailed lemurs using smart feeder. Photo from Oakland Zoo. Enrichments are important facet of everyday life in captive animals. Enrichment not only help modify detrimental behaviors but can also provide a lot of fun and exploration for these animals. 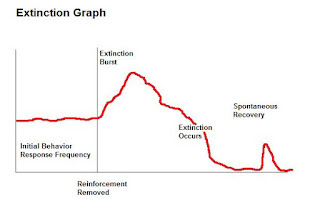 You can provide enrichment to "bored" animals or animals that exhibit stereotypy to occupy their time by exploring or working to get a food reward. Because captive animals have their food provisioned to them, they lost a critical behavioral repertoire --- foraging. Enrichments are also good for humans. Zoo visitors always lament about animals not being visible or animals always sleeping. While it is very natural for animal to seek hiding spots or sleep during the day, enrichment objects will provide these animals with "things to do" during zoo visiting hours and zoo visitors get to see these animals exhibiting natural foraging behaviors. I recently met Dr. Karin Jaffe at the American Society of Primatologists (ASP) 2015 in Bend, Oregon. We talked about our work in lemurs and enrichment. She had mentioned about an enrichment prototype that her and her husband invented. You see, the ring-tailed lemurs (Lemur catta) at Oakland Zoo lives in a large enclosure. However, these lemurs like to hang out in places that are usually out of sight from visitors. The lemurs need the large space but I bet zoo visitors also want to see these lemurs. Dr. Jaffe came up with an ingenious idea --- build a smart feeder that dispenses food (in random intervals) in view of zoo visitors. The lemurs would want to hang out near the feeder and wait for food while zoo visitors get to see these lemurs. Brilliant, right? Which brings me to the reason why I am writing this post. I'm so happy to see her project had taken off but she needs help building a few more of these enrichments for Oakland Zoo. Dr. Jaffe and her team had launched an Experiment.com page for people to help back her smart feeder project: Using smart feeders to increase lemur activity and stimulate human interest. The project is currently at 62% funded and they need about $1000.00 more for the project to get the go ahead (as of Sept 9th, 2015). There's only 7 days left and I REALLY REALLY WANT TO SEE THIS PROJECT TAKE OFF. This project is now 100% funded. Congrats lemurs! Would you please help back this project by donating? Watch the video below and then follow this link to donate. As I am typing this, I have already booked my flight home to NYC. I had planned on going to Duke Lemur Center to do my project for two month but ended up spending the whole summer here. The end is in sight, sorta. I am leaving at the end of this month to go back to my family who I missed dearly. 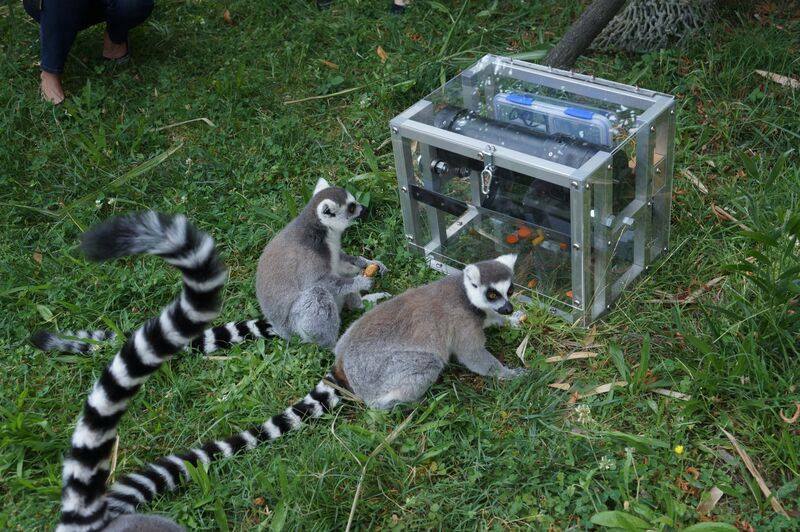 However, most of my lemurs are still not trained and cannot start their testing. Instead, Meg Dye, a trainer at Duke Lemur Center, will be training my lemurs until they are ready to start their tests. I will then fly back to Duke Lemur Center to collect data and finish this project. I have grown to love Durham and the Research Triangle in general. My leaving is bittersweet as I have a few friends here that I won't be able to see for a long time. However, I am sure my husband and cats are waiting for me to come home eagerly. Nothing much to update about the lemurs. Halley is doing great with her tests and I am done collecting data with her. I will let her use SMARTA once or twice after I train Ravo so she gets to "play". Specifically, she gets to use SMARTA as a form of enrichment as I've designed SMARTA to not only be used as a testing apparatus but can also be used as a form of tactile and visual enrichment. The rest of the lemurs are learning to sit correctly in front of SMARTA (stationing). Once that is done, we will train them to appropriate the correct behavior when using SMARTA. 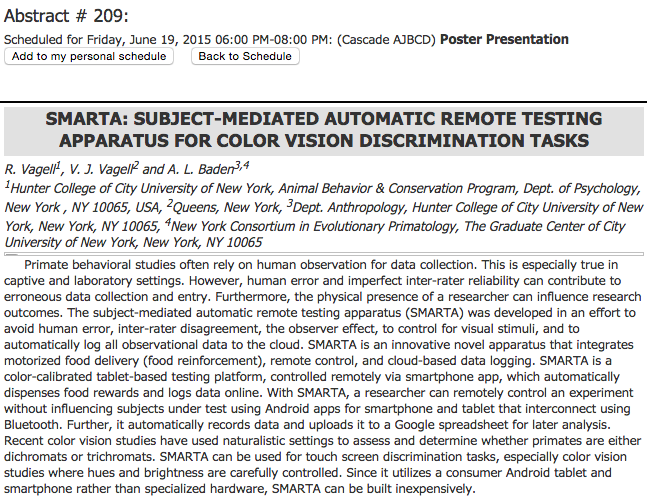 For example, we will train them to sit in front of SMARTA and not do anything until the screen turns on. Once the screen turns on, we will train them to only use one hand when making a choice during the discrimination task. We will also make sure that the lemurs understand that they always have to deliberately touch the red square for a food reward. Welcome to Prancing Papio's Correctional Facility. The individuals mentioned here had their names changed to protect their privacy. These ruffed lemurs were sent in for behavioral modifications and will not be released until they are in their best behaviors. Known to drag their hands on the SMARTA touchscreen without paying attention to the task. Known to mindlessly mash their hands all over the SMARTA touchscreen without paying attention to the task. Have been assigned to learn how to station properly and then targeting the correct stimulus before being released. Known to touch any squares without discrimination. Known to use the touchscreen as support, thus activating the touchscreen. Has been assigned to learn how to station properly and then targeting the correct stimulus before being released. Known to drag her hands on the SMARTA touchscreen without paying attention to the task. Known to mindlessly mash her hands all over the SMARTA touchscreen without paying attention to the task. Their behaviors will be positively reinforced by using a whistle as a bridge. Every positive behavior will be rewarded with food. All else will be ignored. Frustrations will be abound. 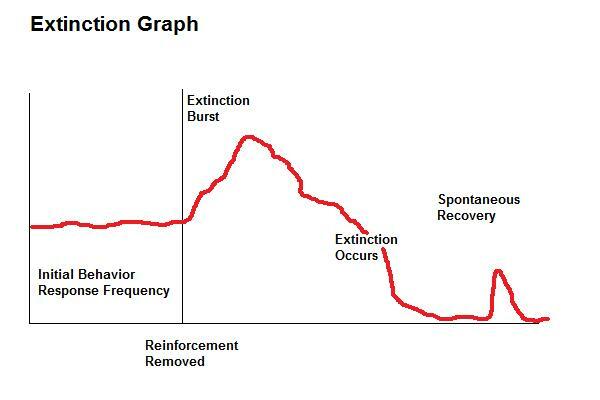 Extinction will be imminent. But will they make it out a changed Varecia? Stay tuned. OK this is too good not to share. It turns out that some of my lemurs have learned that the payout for paying attention and complete a task correctly for a food reward is too much of a hassle. Instead, using their primate ingenuity, they have devised a fail safe plan. What are they doing? Well, one more UI update on SMARTA coming up this weekend so I can train them to correctly do the discrimination task. Inexplicably, every single student that went out to collect data has a "I was collecting data and I got sick" story. Well here you go. This is that story you have been waiting for from me. I got sick this weekend. I felt a bit lethargic and immediately knew that something is wrong. As the day progresses, my temperature started to shoot up and I felt feverish. I was afraid those nasty skeeter (mosquito) bites had given me whatever disease they carried. I was also wondering if I got a sunburn and that's why my body is heating up. Blah blah blah I felt feverish over the weekend and OH MY GOD NORTH CAROLINA YOUR SUMMER IS HOTTER THAN THE SUN! Finally my fever had subsided today after 3 days. 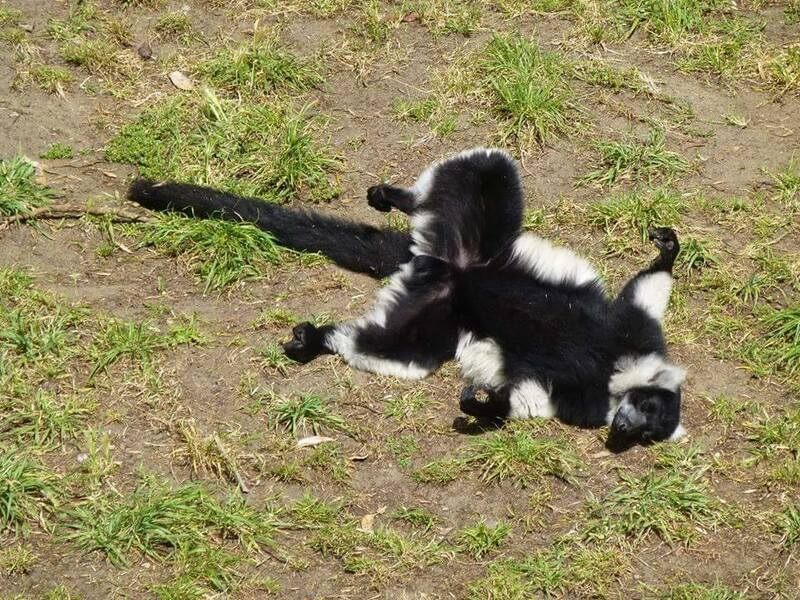 I didn't go in to the lemur center because I was so lethargic that I couldn't wake up. Good thing my puppy was crate trained and I had mustered whatever energy I had to walk her for a few minutes in the morning before I go back to sleep. I also didn't want to pass out from the heat and humidity so I took a day off to recuperate. On Friday, I had a relatively short session and worked with only 3 individuals. At the end of the session, I made a conscious decision to omit one of the group in the study. This has been cumulatively about 3 months working with this group and there was no improvements. Individuals continue to ignore or growl at SMARTA, and not have the initiative to interact with the apparatus. Over the weekend, my friend Jen brought my puppy back to me so she can spend a week with her Papa. Luna, or as she's called in her foster home, Luna Bella Princess Vagell Cupcake is about 4 months old and is a Pomeranian Chihuahua (Pomchi) mix. 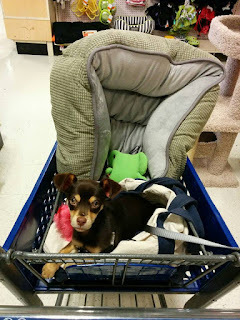 I have written about her a few months back on this blog and I am very grateful that my friend Jen is fostering her while I ping pong between states. We went shopping. ALL THE DOG TREATS!! Because some of my lemurs needed to be indoors around 10 AM today, I was able to worked with 3 groups. 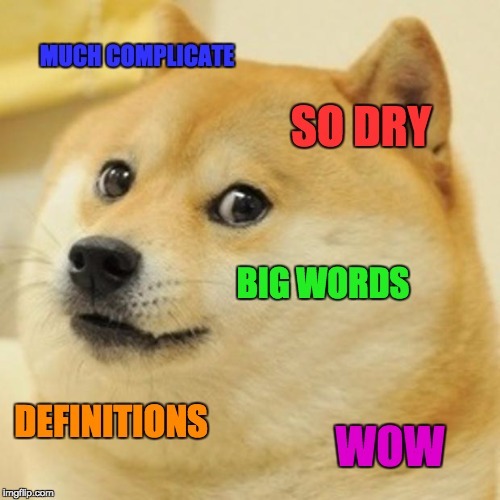 Generally, when I am done with 2 groups, it is almost noon and that's when I have to end my research. Today however, I worked with individuals that had progressed the furthest in that 3 groups. I was able to run testing sessions with 4 individuals today and trained 2 to target. The other 3 individuals were omitted from my study today because their progress is the slowest. Admittedly, most of these individuals that are on the testing session have not learned to target the red stimulus for a food reward. Instead, they have only learned that they need to touch the screen (or any square) for a food reward. 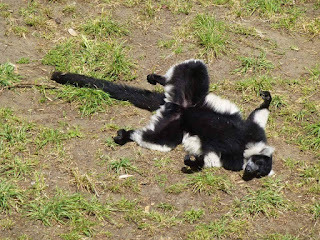 This is the phase when the lemurs will eventually have an AHA! moment and realized that they will only get a food reward for touching the red stimulus. This study is progressing in a good pace. I expect most, if not all of my lemurs will be moving on testing phase by the end of this month and I should wrap up my data collection either mid or end of September. Also, have I mentioned it's HOT HOT HOT!!! The lemurs are definitely progressing with the training sessions but now the difference is how advanced they are (when are they ready to do testing) as opposed to whether they are engaging SMARTA. 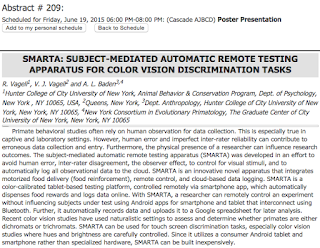 Almost all individuals are engaging SMARTA in various degrees. There are, however, some individuals that want absolutely nothing to do with SMARTA. I might have to take them out from the study. Also, some of these lemurs are craftier than others; some individuals have figured out to just leave one hand on the target during the whole duration of the training session while having the other hand on the chute eagerly awaiting the dispensing sweet morsel. Ha! Day 2: Feeling Hot, Hot, Hot! Yes, I know I'm not supposed to hold my camera like this but that's the best I can do to show you everything. Don't judge. It is extremely hot and humid right now in North Carolina, I mean like ... REALLY hot and humid today. I'm not sure if I am having hot flashes (I don't think I have those) but I was sweating profusely and before it was 10 AM, I was already soaking wet. Ugh. And to think that I was wearing short shorts and loose fitting shirt to stop myself from sweating so much. By the end of the day, I was completely soaked in sweat and I looked like I feel into a lake. After my research session today, I went to Southern Season to replenish my food rewards for the lemurs. Right now, I have moved from using dried cranberries into raisins because the store kept not stocking them. Or if they do, in small containers instead of the large ones that I need (I usually buy 3 large containers that would last me about a month). Monkey enjoying an American mini scone. Monkey enjoyed himself at Duke Lemur Center today and is glad he can be my research assistant for awhile. Started my first day at the Duke Lemur Center early but halfway through my sessions I got a very nasty headache (I think it's a migraine) so had to leave early. Got to work with only 3 lemurs but excited to noticed that one of the female, Kizzy, is now targeting the red stimulus. I think she is ready for testing sessions. Got news that two of the lemurs that I briefly worked with are being transferred to another facility but there will be new individuals coming to DLC in place of them. I guess it's good that I didn't spend weeks training them only to have them go away. Hopefully tomorrow is a bit more productive and I hope to start running testing sessions by the end of the week with the two females! I flew back to Durham yesterday and spent the weekend orientating myself and getting ready to go back to Duke Lemur Center on Monday. My research assistant, Stephanie, finished her term with me last week. I will be working alone once again, but I hope to find another research assistant soon. My trip back to NYC was fun and I needed some time to spend with my husband and cats. During my stay in NYC, I also went to London with my friends and had a wonderful time. More to write about when I go back to Duke Lemur Center but in the meantime, say hi to my new friend, Monkey.